The Tea Dragon Society began as a webcomic by Katie O’Neill. Oni Press collected these comics and published them as a single-volume graphic novel. Now, Renegade Games and Oni Press have brought it to us in the form of a card game. Steve Ellis and Tyler Tinsley designed this engaging and straightforward deck-building game. Katie O’Neill also did the additional art for the game. While I looked through the rules, my children read the how-to-play comic. Although it’s still text-heavy, it fits beautifully with the theme and reads just like a friend teaching you how to play. It was a brilliant touch to include two different methods of explaining the game inside the box; children learn very differently! Two types of cards are available for players to buy: Market cards and Memory cards. Memory cards are organized into four seasons. 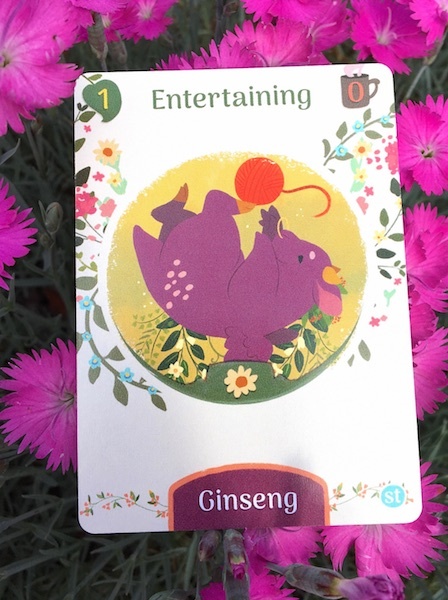 The Tea Dragon Society Card Game starts with Spring and moves through the year, ending in Winter. On a player’s turn, they may either draw the top card from their deck, or spend their “growth” to buy a new card. An active Hold. Sleeping & Entertaining each have 1 growth available to spend. If the player chooses to draw, they add the card to their “hold” (face up next to their deck), and apply any effects that are triggered (usually discarding cards or drawing additional cards). If a player chooses to buy a card, they discard cards from their hold to meet or exceed the growth cost, then add the card to their hold. Market cards are replaced from the deck when bought, but Memory cards are not. When a player draws a Memory card, they shuffle their discard and draw piles together. When only one Memory card remains, the seasons change. That card is discarded and a new season of Memories is laid out. The Market cards are also replaced at the change of seasons. The game ends when only one Memory card remains from the winter season. At that point, players tally up all the points on the cards in their deck, hold, and discard piles. The player with the most points, wins. 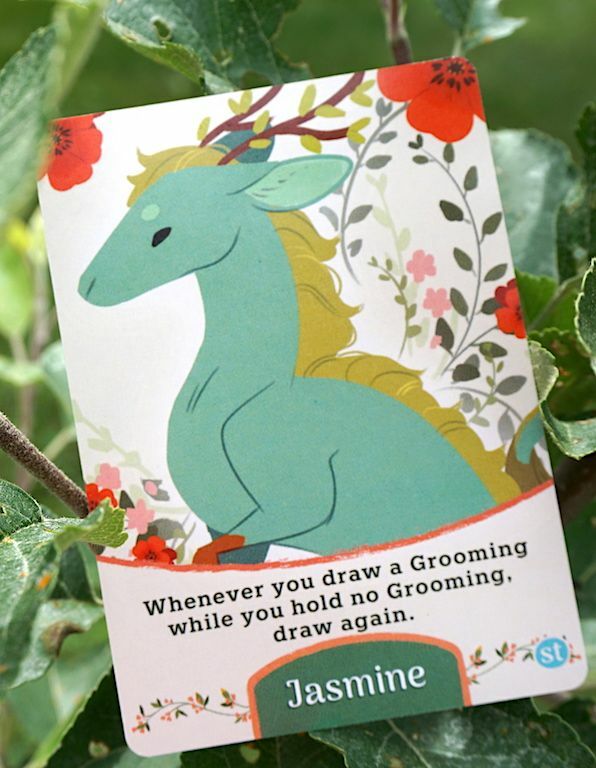 We love the art for The Tea Dragon Society Card Game. The dragons are adorable, and each deck, while functionally identical, gives pictures of that type of dragon performing the various tasks. The how-to-play comic and the instructions both explain the deck-building clearly. The basic concept is taking care of cute dragons and building memories, with no combat and very little interaction between players. The only negative cards are “mischief” cards such as Grumpy, which cause you to discard cards from your Hold. For veteran gamers, it will be frustrating that there is no way to cull such cards from your deck. Market cards fall into 3 basic types: growth cards, end-game point cards, and effect cards (which either protect your growth cards from being discarded by “mischief”, or cause you to draw additional cards). 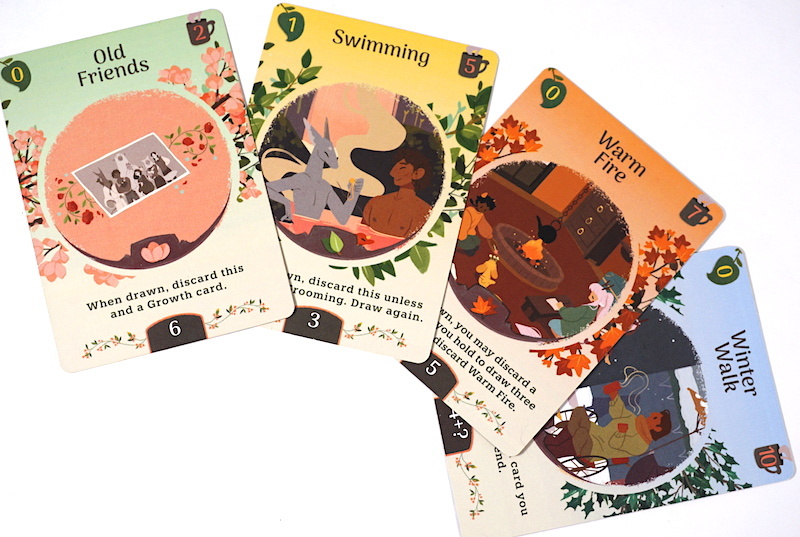 The seasons give The Tea Dragon Society Card Game a sense of forward motion that it would otherwise lack. Each new season presents more powerful (and more expensive) cards to buy, rather than the same old Market cards that come up again and again. 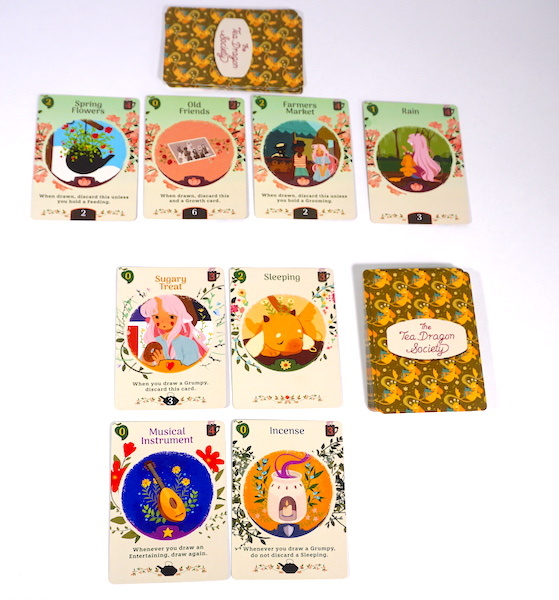 Unfortunately, each play of The Tea Dragon Society Card Game feels very much like the one(s) before. There’s a limited number of cards, and after only two playthroughs, we had seen them all. We didn’t mind playing again because the cards were so cute, and, much like Ancestree, we could try different strategies to gain points. 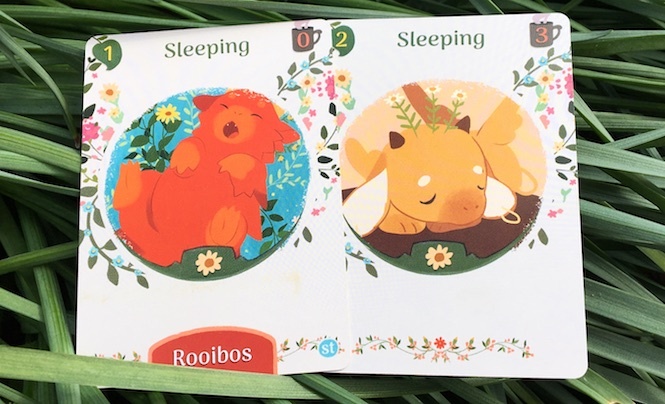 We’d recommend The Tea Dragon Society Card Game as an introduction to deck-building, and for players of any age who want to avoid conflict or “battle” themes. 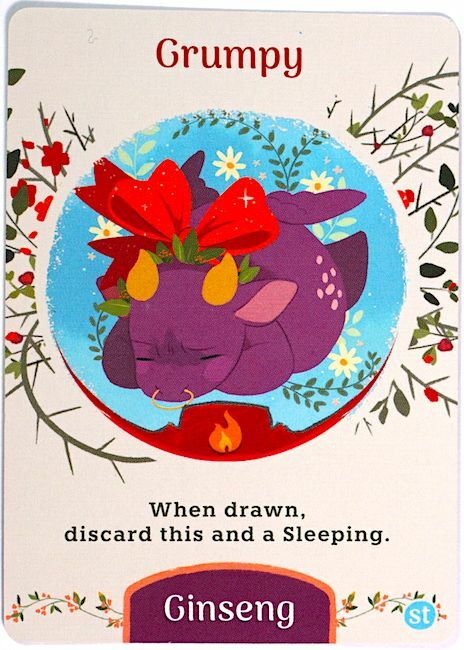 And, of course, anyone who loves cute, cuddly dragons! Be aware: it’s not a great game for young (pre-reader) children, because there is a lot of reading required. Gamers looking for a deeper experience in deck building might be better served to look elsewhere. Find The Tea Dragon Society Card Game on Amazon or your local comic store. The Family Gamers received a promotional copy of The Tea Dragon Society Card Game for this review.